Despite God’s clear statement to believers, we are tempted to think that we are experiencing a “strange thing” when trials and suffering come. They often catch us unaware, and in the midst of our crisis, joy seems like an unimaginable response. Yet, thinking God’s truth from Scripture during these difficult seasons will enable us to thrive in the midst of our trouble. 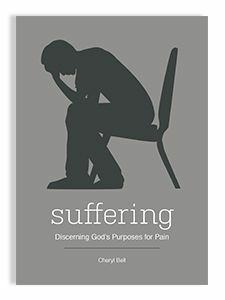 In this booklet, author Cheryl Bell relates the biblical teaching on the subject of suffering, illuminating God’s redemptive purposes for life’s difficult seasons, including spiritual growth and life transformation. Cheryl Bell serves as an adjunct professor of biblical counseling at Southwestern Seminary, where she also provides counseling services to the women of the seminary as part of the ministry of Southwestern’s Walsh Counseling Center. She earned her Ph.D. in Biblical Counseling and her Master of Arts in Religious Education from Southwestern. She and her husband Rex have four children and two grandchildren.